Cap 8-12.0 cm broad, deeply convex, expanding to plano-convex, disc flattened or depressed; margin incurved in youth, then decurved, eventually straight or slightly raised; surface dry, disc uniformly dark-brown, becoming appressed fibrillose-squamulose, diffusely so toward the margin, ornamentation brown over a pallid ground color; cuticle sometimes bruising slowly tawny-brown, yellowing in KOH; context white, soft, up to 1.5 cm thick, unchanging or cream to tawny when injured; odor of anise; taste mild. Gills free, close, relatively broad, whitish when young, becoming blackish-brown at maturity; lamellulae five to six-seried. Stipe 6-12 cm long, 1.5-2.0 cm thick, tapering to an enlarged, often bulbous base, stuffed to hollow at maturity; surface of apex whitish, silky-striate, the lower portion white, fibrillose or the fibrils forming scattered appressed squamules; stipe base discoloring slowly dull orange-brown where handled; context unchanging or sporadically cream-yellow to tawny-brown when injured or cut; veil white, membranous, with small buff-brown, floccose scales concentrated near the margin, leaving a thin, pendulous annulus high on the stipe. Spores 6.5-8.0 x 4.5-5.0 µm, smooth, thick-walled, ellipsoid in face view, inequilateral in profile, hilar appendage not conspicuous, germ pore not evident; spore print blackish-brown. Solitary or in small groups under conifers and hardwoods; found primarily in urban parks with trees like Monterey Cypress, Monterey pine, and Eucalyptus; fruiting from mid to late winter. Agaricus perobscurus is a relative of Agaricus augustus and like the "Prince" has an anise/almond odor and a cuticle and stipe which yellows slowly (sometimes faintly) when bruised. 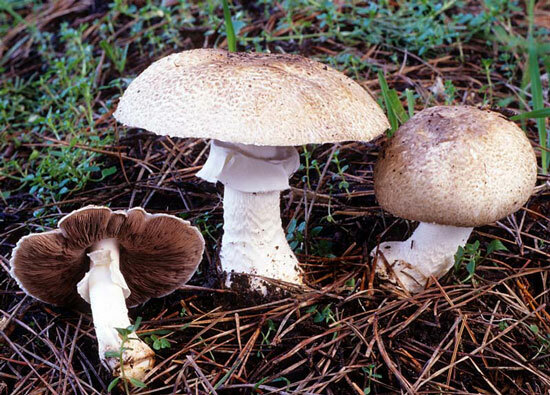 Unlike Agaricus augustus which is widely distributed in North America, A. perobscurus at present is known only from the San Francisco Bay Area. Besides smaller size, it is distinguished from Agaricus augustus by a darker-brown squamulose cap, a stipe surface which is patchy fibrillose when young, not densely floccose-scaly, and a mid-winter rather than spring-summer-fall fruiting season. Another Agaricus species that is sometimes confused with A. perobscurus is A. praeclaresquamosus, a toxic species. It can be differentiated by a dark-grey, not brown squamulose cap, a phenolic, not anise odor, and a stipe base which yellows immediately when injured.